FACT mix 371 comes from Philip ‘Efdemin’ Sollmann. A key figure in German techno’s more romantic side, it’s no surprise that Efdemin’s favoured home over the years has been Dial Records, a label that specialises in yearning 4×4 that interacts with the world like a new born child, wide-eyed and overwhelmed by possibility. Kick drums that crunch like snow underfoot and melodies constructed from the world’s most longing bells and chimes. To portray Sollmann as just another Pantha du Prince-alike, though, is to do him a massive disservice: when in the mood, his music arguably jacks harder than anybody else in the Dial stable. His second album was titled Chicago, after all. 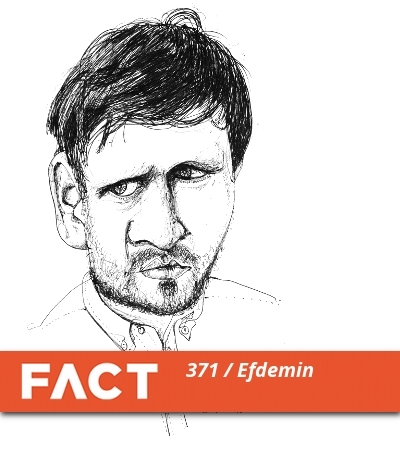 As a DJ, Efdemin’s equally prone to throwing caution to the wind: his 2008 mix CD, Carry On – Pretend We Are Not in the Room featured cuts from the likes of Scott Grooves, Patrice Scott, Surgeon and Dettmann & Klock, and today’s FACT mix – recorded to promote Efdemin’s forthcoming appearance at Dimensions Festival’sLondon warm-up party with Electric Minds – features frosty acid and heavy-duty rollers from DJ Qu, Black Jazz Consortium, Phuture, MLZ and more. Zone out below.